Sen. Claire McCaskill (D., Mo.) has worked to distance her political career from her husband's investment career, especially when it's negatively spotlighted in the press, but her husband’s investment company now employs McCaskill's former campaign spokesman to handle its press. 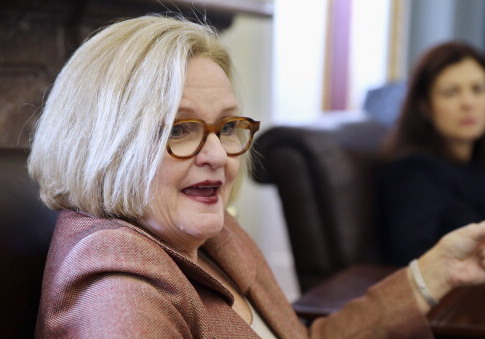 The wealth of McCaskill's husband, Joseph Shepard, has long caused political problems for the senator, most recently on Tuesday when the Kansas City Star reported that his businesses had received $131 million in federal subsidies since McCaskill took office in 2007. Last month the report was that Shepard had millions of dollars invested in a hedge fund using offshore tax havens. McCaskill has responded to stories on Shepard's investments by saying she has no involvement in them, but in an apparent effort to mitigate damage to McCaskill's reelection effort, Shepard's company Sugar Creek has brought in the political consultant who helped McCaskill first get elected to the Senate in 2006 to handle its damage control efforts. Tony Wyche is president of Soapbox, a public relations and political consulting company based in Missouri that still lists McCaskill as its top political client. His LinkedIn résumé shows a long track record of work in Democratic politics, including two-year stints as communications director for the Missouri Democratic Party and deputy press secretary for the Democratic National Committee. His company was paid $44,500 by McCaskill's 2006 campaign, throughout which he was quoted as her spokesman. Wyche was first quoted as a spokesman for Shepard's company in May. He is quoted throughout Tuesday's report on the federal subsidies received by Shepard's companies. Wyche's social media activity indicates he remains engaged with politics and is especially invested in McCaskill's reelection effort. On Twitter, Wyche often retweets both McCaskill and her campaign account. He regularly criticizes her Republican opponent Josh Hawley and celebrated a recent critique of Hawley by McCaskill's current communications director as "brutal." This entry was posted in Politics and tagged 2018 Election, Claire McCaskill, Missouri, Senate Democrats. Bookmark the permalink.